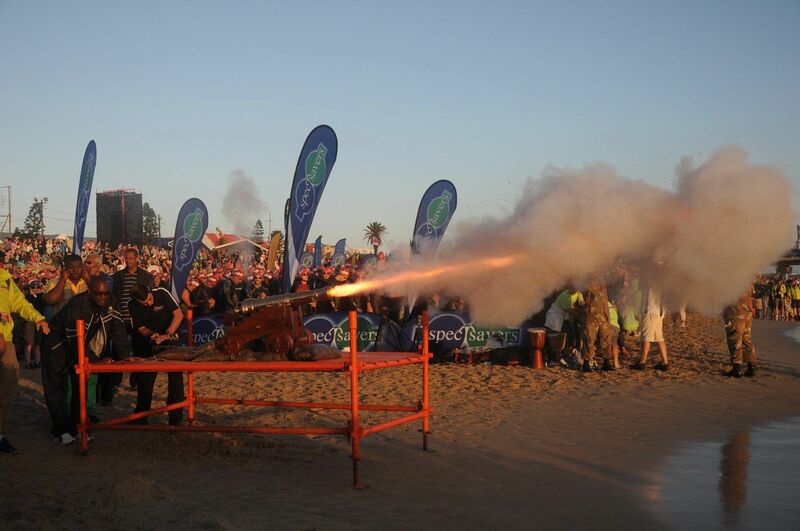 Over too many years to count, Palmer's Armoury has been honoured to start the IRONMAN 70.3 South Africa and subsequently the IRONMAN African Championship by cannon fire. Although the starting combination sometimes varies, the brass 1 pounder is standard fare and is responsible for a resounding roar the professional athletes are off into the water to mark the beginning of one of the most well, publically, supported IRONMAN competitions in the world. On the instruction of race director, Paul Wolff, the second round of athletes are sent into the water by a well-timed blast from an iron 1 pounder cannon. Zane proudly tells the tale of how he STARTS the Ironman in Nelson Mandela Bay each year but never has the need to finish it to get the t-shirt.